Thinking of Trading at Field of Dreams 2019 Show? Here's how it works, please read before booking. 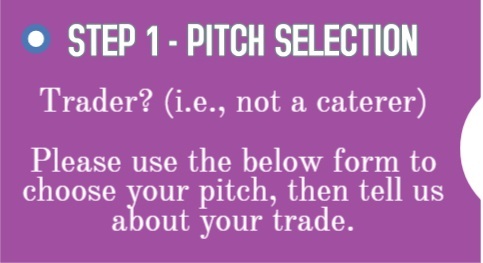 Use the form below to select your desired pitch size (*not for caterers) and then click 'Continue' in order to tell us more about you & your trade. Please be sure to upload your documents. 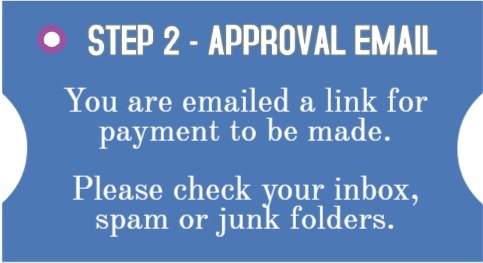 If approved, you will then be emailed with a link for payment to be made - keep an eye on your junk mail box as it may end up in there. Thinking of Catering? 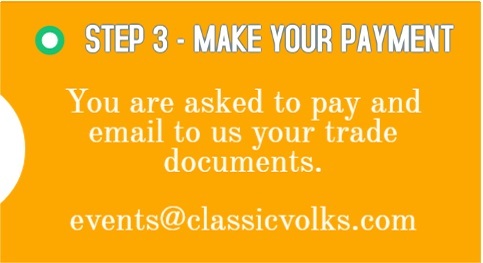 First send an email to: events@classicvolks.com before booking. If you wish to cater at the 2019 please also email me with details about your catering trade, including full menus with prices; we'll help you from there on. First time trading at Field of Dreams? Here's what to expect. As a show trader, you can arrive and set up from 11:00am on Friday 30th - the gates open to weekend campers from 2pm, give your trade name at the gate, you will be issued with the correct number of wristbands, please ensure you purchase any extras needed, either before the show or on the gate. Once you have your wristbands, you will be given a pitch number and pointed in the direction of the trade area. Live bands play every night, so depending on your trade, you may want to stay open until the shows end at midnight. Any questions, just ask a member of staff at the main office (you'll easily see where we're set up) or a member of the show crew or security staff seen during the show. We try to ensure that each trader offers something different which means we cannot accept every booking request but will respond to each one made by email. If successful, you are emailed a link for payment to be made. Be sure to check your Junk folder - classicvolks.com may not already be in your contact list. On making payment for your pitch you will get a confirmation email, this time with a link to your Trade pass/tickets for entry to the show. Print them and take them with you. As so much of this is done by email, please ensure you input your email address very carefully. We enjoyed both being at the show as well as Trading at the show. As mentioned on our main Show Traders page, entry to Escrick Park Estate (for those confirmed) is from 11:00am on Friday the 30th of August 2019. See you all again soon! As the date draws ever closer to this years show we continue to respond to any and all show related questions you may have. We would ask that all those able to Trade with us this year ensure their booking is confirmed in time for us to respond in time for your anticipated arrival.